Do You Qualify for Factoring? Invoice factoring is one of the most accessible forms of business financing. It takes just a few minutes to know if you business qualifies. Our customer retention rate is 1.9 times the industry average. We offer 30-minute application approval, low rates, high advances and 24-hour funding. Don’t wait 30, 60 or 90 days for your customers to make payments anymore. Learn how to turn your debtors into assets. Sell your outstanding accounts receivables to us and get fast cash flow funding. How much cash upfront you'll get? What is a factoring fee? What factoring rate can your business get? How fast can your business get approved? How fast can you get funded? How many invoices do you need to factor? How reliable are online endorsements? Approval process: dealing with algorithms, brokers or decision makers? Who takes care of your factoring account needs? Offering accessible and quick cash flow solutions to businesses in most fields. WHY CHOOSE GATEWAY COMMERCIAL FINANCE? Improve your business cash flow fast! We are known as one of the best factoring companies due to our low monthly minimums, competitive rates and ability to help our client companies grow. We provide funding to cover payroll, expenses and other supplier demands to large and small businesses in all industries. We are the fast funding option when the banks refuse to give you a loan. Our application process is simple, and we offer same day account approval. Our rates are the most competitive in the industry and we are ready to work for you to put cash in your company's bank account quickly! 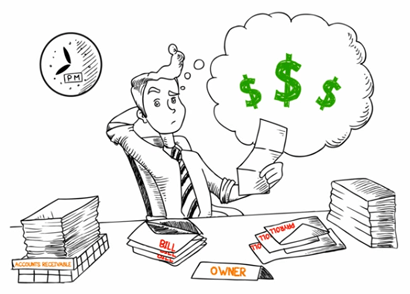 WHAT IS THE DIFFERENCE BETWEEN FACTORING, INVOICE FINANCING & ACCOUNTS RECEIVABLE FINANCE? Accounts receivable factoring is a transaction in which a third party (factor) purchases a business's invoices at a discount. The factoring company, as a result, now owns the accounts receivables. Invoice finance, also known as accounts receivable financing, is a loan in which a business pays a predetermined percent of their invoices to a lender as a fee for the lending service. In this case, the invoices serve as collateral as the business pays off lending fees when invoices are paid. Account receivable financing is very similar to bank loans but with much higher lender rates. While both solutions are meant to solve short term cash flow problems, invoice financing generally carries much higher costs and risks than receivables factoring. "They helped us lay out a clear strategy for effective credit policies and procedures." "With Gateway, my only concern now is how big to grow!""